VATICAN CITY (AP) – President Obama and the Vatican gave distinctly different accounts of the president’s audience with Pope Francis on Thursday, with Obama stressing their common ground on poverty and inequality but Vatican officials emphasizing concerns over Obama’s health care law, which mandates contraception coverage. 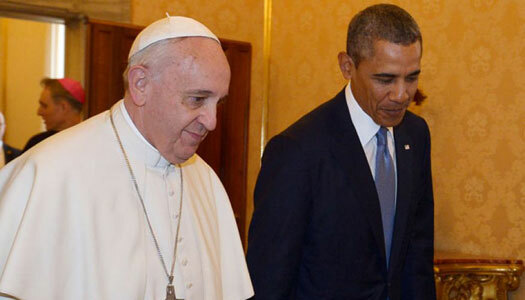 Obama described himself as “incredibly moved” by his nearly hour-long session with the popular pontiff. He said the two spent the most time discussing the plight of the poor and the marginalized as well as regions of conflict and the elusive nature of peace around the world. The Vatican, in a statement shortly after the meeting, said discussions centered on questions of particular relevance for the church in the U.S., “such as the exercise of the rights to religious freedom, life, and conscientious objection” – issues that have fueled divisions between Obama and the church. Contraception coverage and religious freedom have been central to the church’s objections to Obama’s health care law, which is facing a challenge on those grounds before the Supreme Court. The marked difference in emphasis introduced a perplexing element to the long-anticipated meeting, which the White House has looked forward to as way to validate Obama’s economic policies. In a report on Vatican Radio the day before the meeting, the Vatican had signaled that the divisive issues would indeed be on the agenda. “You know, I actually will probably read this when I’m in the Oval Office, when I am deeply frustrated and I am sure it will give me strength and will calm me down,” Obama said. Obama is the ninth president to make an official visit to the Vatican. Later, Obama recalled the meeting as an elevated discussion about the role of empathy in public and private life. But he also said that while he shared the pope’s economic views, he didn’t expect Francis to form a coalition or partnership with him on any issue. Obama arrived at the Vatican amid all the pomp and tradition of the Catholic Church, making his way in a long, slow procession through the hallways of the Apostolic Palace led by colorful Swiss Guards and accompanied by ceremonial attendants. The two greeted one another in the Small Throne Room, before sitting across from one another at the pope’s desk, as is custom for a papal audience. Obama presented the pope with a seed chest with fruit and vegetable seeds used in the White House garden, mentioning that he understands the pope is opening the gardens at the papal summer residence to the public. The chest was inscribed with the date of their meeting and custom-made of leather and reclaimed wood from the Baltimore Basilica – one of the oldest Catholic cathedrals in the U.S.
“Why not?” the pope responded in his native Spanish. Although the Vatican has not yet confirmed the trip, it is likely that Francis will travel to the U.S. in September 2015 for the church’s World Meeting of Families in Philadelphia. Popes have attended these family celebrations five of the past seven times they have been held, and Francis has put family issues at the forefront of his agenda.